Students and staff raised a massive £3,017.52 for Cancer Research UK during a week-long programme of events held at the academy. Having listened to our student voice, the student leadership team made the decision to support Cancer Research UK, as the disease had touched many of their lives, encouraging them to offer their own support. The week kicked off with two bake sales, supported by Lorilops of Lowestoft who donated their delicious cup cakes, complementing those brought in by students and staff. The following day a well attended, lunchtime karaoke session was held, at which further funds were raised on the door. Day three of the week saw 34 students and staff take part in a sponsored walk from Southwold to Lowestoft. Grebe Coaches sponsored the event by subsidising the cost of coach travel to Southwold. The journey took in the coastal path as well as some of our local countryside. Students were very grateful at the generosity shown by the Co-Operative Store in Pakefield who were kind enough to supply ice lollies to each and every one, as they neared the end of their 16 mile walk. Many other students and staff chose to take part in sponsored exercise during their PE lessons throughout the day, clocking up considerable mileage. This event was particularly well sponsored with one student, Ethan clocking up the highest pledge of £330. Two weeks preceding the series of events saw students voting for the member of staff they would most like to see have their legs waxed. Four male members of teaching staff were brave enough to put their names forward! Voting was by donation; the ‘winner’ being that member of staff whose donations amounted to the most. Lunchtime on day four of the week was quite exciting as the suspense began to build when students and staff alike gathered and waited with apprehension as the names of the staff were announced in reverse order. After some visible relief from the runners up, (Mr Buisst, Mr Cooper, Mr Brown), Mr Pinner found himself at the mercy of the wax and, amidst a series of questionable facial expressions, preceded to have his legs waxed by consultants from Lowestoft-based salon Millie Rose Hair & Beauty. A non-uniform day was also held when students and staff wore one item of pink or blue, and made a donation for the privilege. The week’s events ended with a staff shave-off. This was based on a cumulative total system, where the more donations made throughout the week, the better a chance of witnessing more staff at the mercy of the clippers. All staff who volunteered for this event found themselves due for a new look! Three members of staff had their heads shaved, whilst the Vice Principal, Mr Bown, succumbed to having his beard shaved off, and two students bravely volunteered to have their long locks removed. Head Girl Lauren made the tough decision to have her long hair cut off, as did fellow student Trinity Jane – their hair has been donated to the Little Princess Trust which provides real hair wigs free of charge to young children suffering with hair loss. Throughout the week, Cancer Research UK merchandise was on sale, supplied by Lauren Lou in aid of Cancer Research UK. 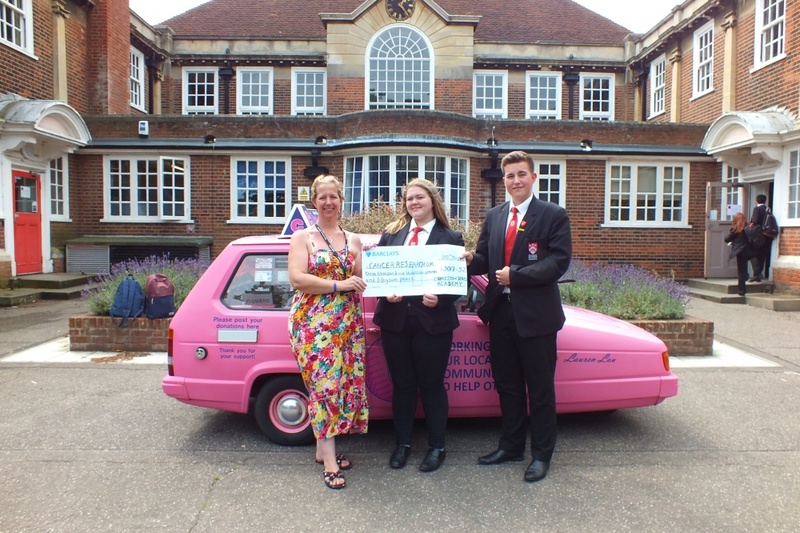 The local fundraising group supported the events on the last two days of the week, bringing along their three-wheeler modified vehicle, to help promote awareness, and selling merchandise; the proceeds from which were very kindly donated towards the academy’s running total. On the final day a pledge cheque was presented to Gary Bennett representing Lauren Lou in aid of Cancer Research UK. Suzanne Chapman, Volunteer Marketing Manager for Lauren Lou in aid of Cancer Research UK said: “We were thrilled to be a part of this amazing event at Ormiston Denes Academy! Over £3,000 raised! Incredible! “Team Lauren Lou took great pleasure in attending the academy over a two-day period to sell merchandise to the students and teaching staff. Whilst there, we spoke to and witnessed the enthusiasm and efforts of both the children and members of staff, in raising as much money as possible for Cancer Research UK. “Fantastic organisational skills to set up so many fundraising parts to this event. Both the children and all staff members equally, should be very proud of the parts they have played, as they have set an incredible example for all to see! Students and staff have supported other charities throughout the 2016/17 academic year, such as Children in Need, Macmillan Cancer Support, Red Nose Day, with totals approaching £2,000. Posted in Academy news on 3rd August 2017.